There are 7 users watching this listing. Use TB2QA8X to reference this item. Souriez dans le traffic, vous pourriez sauver une vie. Exchanged this trackable because it holds some meaning to us; One of us rides a motorbike, promise to keep moving. Found this Bike Awareness coin not far from where I work, I thought the location was very appropriate, it was in a garden in the middle of a roundabout with a motorway running above it. 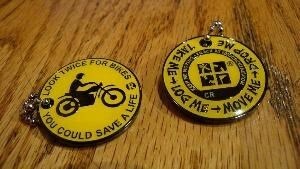 Having lost a friend myself in a bike accident I feel honoured to be able to move this coin on as it is spreading a very important message. My second thought when I read the logs on this coin is where and when it originated, I had to smile as I work for a Swedish company and my son was born shortly after this coin was put out on its travels. Thank you so much for making me smile and remember things I hadn't thought of for a while and heres to the next thousands of miles this coin will travel.